Bismarck is home to a diverse mix of educational institutions, including private and public. Numerous higher education offerings are available, most notably Bismarck State College, University of Mary, and United Tribes Technical College. Bismarck schools have among the highest graduation and attendance rates in the country, in addition to being a leader in standardized testing scores. The first Bismarck school was opened in 1873 by Linda Warfel Slaughter, with the first graduating class consisting of two students in 1887. Bismarck Public Schools is the largest school district in the state, serving 12,861 students (as of 2016) and one of the region’s top employers, employing more than 2,100 people. As of 2017, the district operated 16 elementary schools, 3 middle schools, 3 senior high schools, an alternative high school, and the Career Academy and Technical Center. The district’s graduating class consisted of 774 graduates in 2017, with the largest graduating class consisting of 826 in 2003 (excluding private schools). Several Bismarck schools have been recognized as “Blue Ribbon” award recipients, the highest national honor, including Bismarck High, Century High, Horizon Middle, Northridge Elementary, and Highland Acres Elementary. There are currently sixteen public elementary schools in the Bismarck Public School district. Will-Moore is the oldest elementary school building still standing, opened in 1952, and Liberty is the newest, opened in 2014. Bismarck Public Schools operates three middle schools: Simle, Horizon, and Wachter. Hughes Junior High opened in 1958, followed by Hillside Park Junior High (now Simle Middle School) in 1962, both replacing the original junior high facility that had been built in 1912 to house the high school. Wachter Middle School opened in 1967. Hughes was replaced in 2001 by Horizon Middle School. Bismarck Public Schools operates three public high schools and an alternative high school. The current Bismarck High School building is the oldest facility within the school district, completed in 1935. The building has seen several expansions and renovations since, including major ones in 1986 and 1998. Bismarck High is currently the largest school in the district in terms of number of students, with nearly 1,500 students, and the state’s second-largest high school. Bismarck High’s school colors are maroon and white, and the school has used the Demon mascot since 1922. To meet the demands of the growing city, a new high school was completed in 1975. The school takes its name from the fact that it was approved in 1972… Bismarck’s centennial year. Coincidentally, its completion also coincided with the nation’s upcoming bicentennial the following year, leading to the school adopting its mascot as the Patriot with its official patriotic colors of red, white, and blue. In September 2012, voters overwhelmingly approved a school bond that includes the construction of two new elementary schools and a third public high school. Legacy High School opened in 2015. South Central is the district’s alternative high school. In 2013, the school relocated into the former Riverside Elementary. Bismarck also has several private school options. Shiloh Christian and Saint Mary’s Academy are the largest private school institutions in the region, with Saint Mary’s High School being the largest private high school in all of North Dakota. Bismarck has several options for post-secondary education and training. 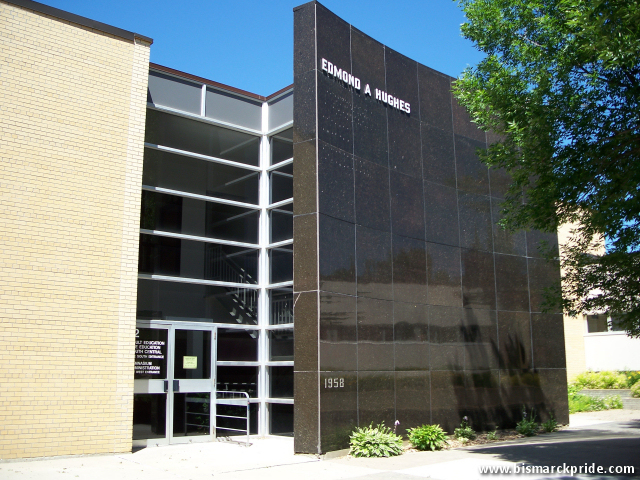 Established in 1939, Bismarck State College offers mostly 2-year degree programs. The college does offer one in-house 4-year program, and partners with state universities to offer other on campus programs. The University of Mary is a private Catholic-based college offering both 2- and 4-year programs. It is the largest degree-granting institution in the region. The school was established as Mary College in 1947 and granted full university status in 1986. Between 2003-2015, Minnesota-based Rasmussen College (previously known as Aaker’s College) operated a Bismarck campus. Rasmussen shuttered their Bismarck campus in 2015. Other options include United Tribes Technical College, Sanford College of Nursing, The Hair Academy, and JZ Trend Academy. 1873 – Linda Slaughter establishes the first local school. 1884 – North Ward School opens on the site now home to Will-Moore. It replaced the original two-room schoolhouse on the current site of the Provident Building. It served all grade levels until 1912. 1912 – Designated building for Bismarck High School opens. It is replaced by the existing Bismarck High School in 1935, at which time the building houses junior high levels until Simle opens in 1961. 1918 – North Ward School is renamed William Moore School. The original Wachter School opens. 1920 – The original Richholt Elementary opens, named for F.H. Richholt, who retired from the school board in 1917. 1935 – Current Bismarck High School opens. Former high school building continues as junior high. 1952 – Will-Moore Elementary opens in January on the former site of North Ward/William Moore. Will School closes. Saxvik Elementary opens, named for H.O. Saxvik (closed in 2016). 1954 – Northridge and Pioneer Elementary schools open. 1958 – Hughes Junior High is constructed for 1959 occupancy. Highland Acres Elementary opens. 1961 – Hillside Junior High opens. The former 1912-built junior high/high school building adjacent to Bismarck High School is demolished. Northridge is expanded. 1962 – Hillside Junior High is renamed Simle after former Superintendent T.E. Simle. 1964 – Grimsrud Elementary opens, named for educator T.S. Grimsrud. 1967 – Wachter Junior High opens, named for the Wachter family who donated 10 acres of land for construction of the namesake junior high and Dorothy Moses Elementary. 1968 – Wachter Junior High is expanded. 1969 – Rita Murphy Elementary opens, named for a former teacher. 1972 – Dorothy Moses Elementary opens, named for a longtime school board secretary who served under H.O. Saxvik. 1973 – Jeannette Myhre Elementary opens, named for a former teacher and principal who served the district from 1924-1966. 1974 – The Vocational-Technical Center (VoTech) opens on the Bismarck Junior College campus. 1975 – Century High opens. New Roosevelt Elementary opens, and the former school is demolished. 1976 – Dorothy Moses Elementary expands. 1977 – Prairie Rose Elementary opens. 1979 – Robert Miller Elementary opens, named for the former superintendent. Dorothy Moses Elementary expands again. 1983 – South Central High School is established at 222 W Bowen Avenue. 1987 – Victor Solheim Elementary opens, named for the former Assistant Superintendent. 1989 – Centennial Elementary opens, named to commemorate the state’s centennial anniversary. 1991 – Simle adds a new south wing. Wachter becomes North Dakota’s first school to switch to the middle school format. 1994 – Simle changes to the middle school format. 2003 – Richholt Elementary closes. BECEP occupies the building. 2010 – Sunrise Elementary opens. 2014 – Liberty and Lincoln Elementary buildings are completed. 2015 – Legacy High School building opens.